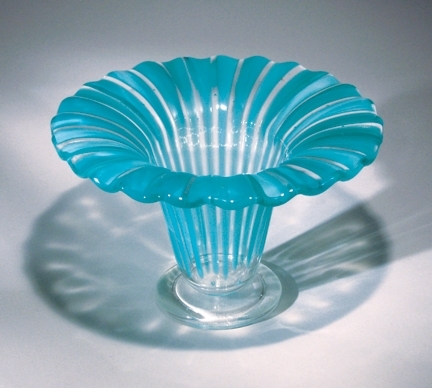 This ingenious, 2-sided mold system lets you choose between creating a true spherical-shaped bowl with a cookie-style foot that is remarkably similar to vessels made by master glass blowers or flip the mold over to produce a flat, serving platter with an elevated 5/8" delicately upturned rim on a cast glass foot. Simply fill the casting reservoir with frit or scrap glass and cast. 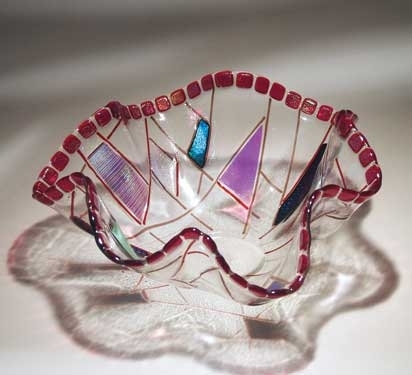 Simply design your bowl - you can use a pre-fused design disk or simply cut a 12" circle from your favorite glass and slump to create a unique bowl or platter that you'll cherish for years to come. Includes complete instructions and firing schedules. Watch a video of the BinaSphere in action! Contains 32 full-size line drawings in total - 20 of these are printed on oversized fold-out sections (17" x 22" - 43 x 59 cm). 27 projects which include a list of specifications, firing schedules, the forming mold used and color suggestions. 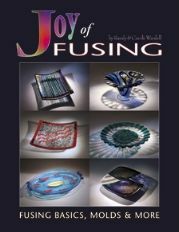 The M35 Mold from the best-selling Joy of Fusing Book. Now you can make the projects with ease with these fusing tools! This bundle contains everything a fuser needs to cast a foot disk then drape a bowl and fuse a short-stemmed foot to the base. The package includes the M35 Starfire mold, the C105 Foot Casting Mold and 3 Sets of F500 Stackable Foot Rings (enough to add a foot to 3 bowls) plus a 12-page color Instructional Booklet. 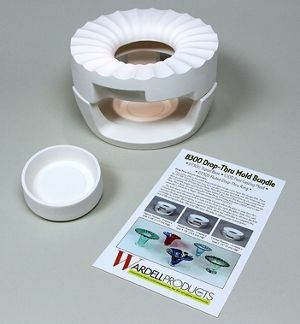 The ceramic mold plus a 12-page color Instructional Booklet on how to make this bowl plus a photo gallery of six other designs. Mold is 12" x 4" (30.5 x 10.2 cm). 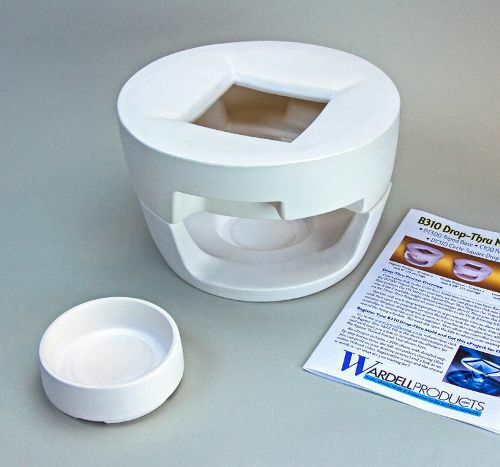 The ceramic foot casting mold from the B235 Bundle plus 1 set- F500 Stackable Fusing Foot Rings and a 4 page Instructional Booklet. Mold is 4" x 2 7/8" (10.2 x 7.3cm). 2 sets of the Stackable Foot Rings plus a color information card with how-to instruction. This innovative Drop-Thru Mold Forming System enables fusers to create a contemporary, drop-thru, footed vase in a kiln that is remarkably similar to vessels made using traditional glass blowing techniques. 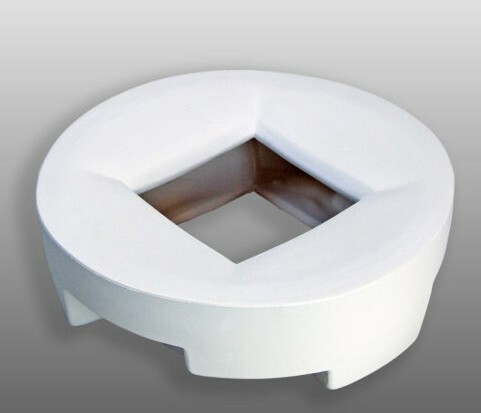 Start with a 2 layer circle design that Drops-Thru a square hole in the ring mold then the glass drop is automatically aligned to hit and fuse to the center of a pre-cast glass foot disk. 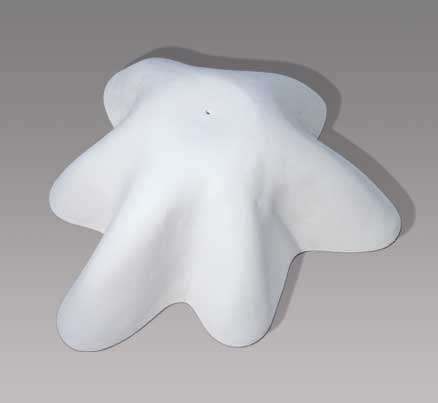 • The C100 Foot Casting Mold, used to create a 2 7/8" (7.3 cm) diameter x 1/4" (64 mm) thick cast glass foot disk using our ‘Scrap Casting’ technique. 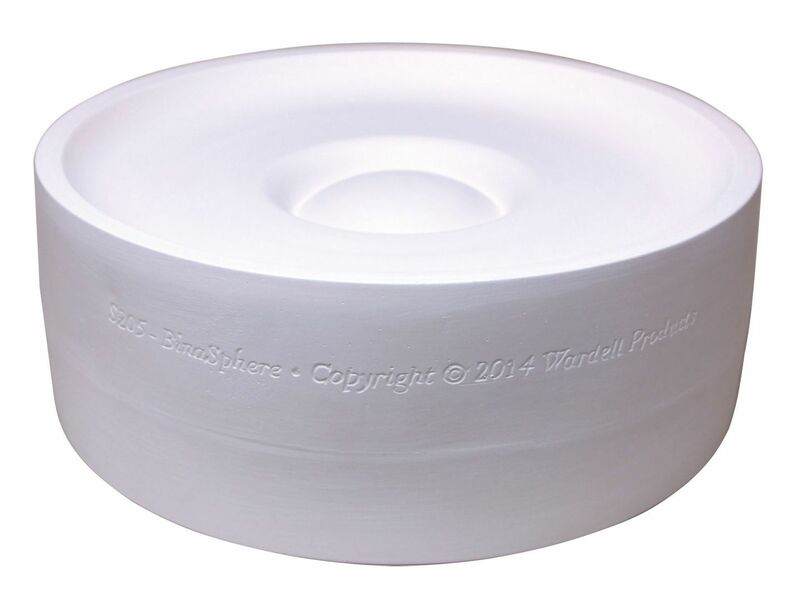 • The DT310 CircleSquare Drop-Thru Ring to shape the vase and guide the drop onto the cast foot disk. • The DT300 Tripod Base to support the Drop-Thru Ring while holding and centering the cast foot disk. 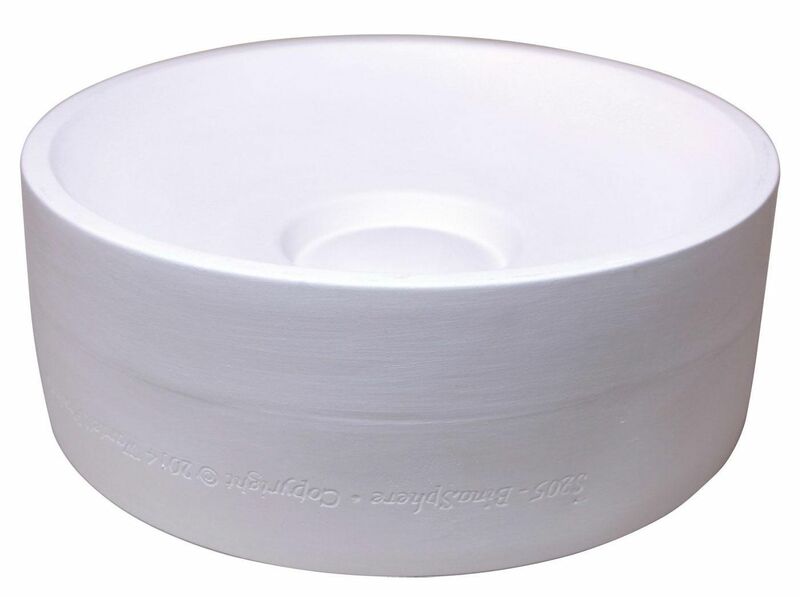 The mold is 7 3/4" (19.7 cm) wide by 4 3/4" (12 cm) high and can be used in most medium-sized kilns with a firing chamber that is at least 10" (25.5 cm) in diameter (or square) and 5 1/2" (14 cm) high. Four page instructional book included. Height Adjustable: Turn the ring 1/3 of a revolution to re-position it at 3 different levels to create 3 distinct Drop-Thru vase heights. 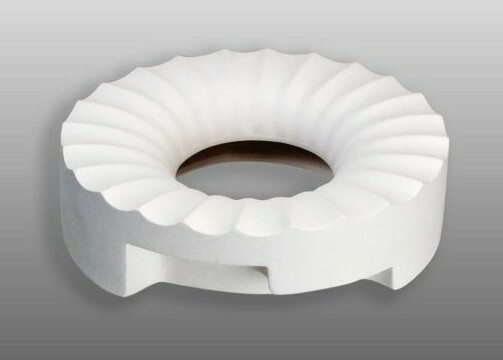 If you already have the B310 Circle Square Drop-Thru Vase then all you need to get is the Fluter Drop-Thru Ring (the topmost part). You can buy it separately and use it with the B310 Base and C100 Foot Casting Mold! Watch the video on how to use this innovative Mold System! 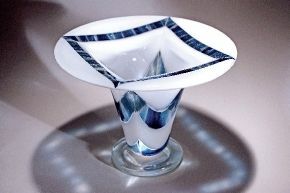 • The DT305 Fluted Drop-Thru Ring to shape the vase and guide the drop onto the cast foot disk. If you already have the B300 Fluted Circle Drop-Thru Vase then all you need to get is the Circle-Square Drop-Thru Ring (the topmost part). You can buy it separately and use it with the B300 Base and C100 Foot Casting Mold!